The next stop on the Adidas Next Generation Tournament is upon us with Kaunas ready to host the world from January 19-21. Here is a run-down of the teams with some of the top players to watch. This will not really resemble the team that won the ANGT title last season. This is more a rebuild for the organization as the 16-player preliminary roster features 12 players born 2001 or 2002. 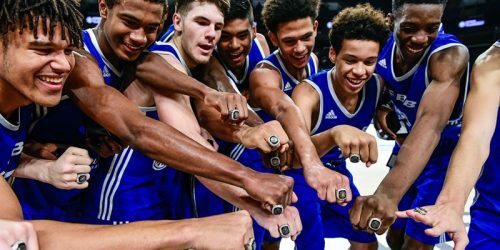 Three of the four 2000-born players were on the title-winning team with Yohan Choupas, Mathis Dossou-Yovo and Johan Randriamananjara while Marko Coudreau played at the ANGT Kaunas but not in Istanbul. And while this might be a young CFBB team, it’s definitely talent-laden among the younger ranks. Timothe Crusol, Essome Miyem and Lorenzo Thirouard are all 2001-born players who had a magical 2001, winning the ANGT title in Istanbul and then helped France to the crown at the FIBA U16 European Championship 2017 in Podgorica in August. Also part of the U16 continental title among the CFBB roster are Daniel Batcho, Leo Billion, Maxime Carene and Victor Diallo. Crusol, Dossou-Yovo and Choupas will definitely be the leaders of this CFBB team in Kaunas. Five players are back from the team that only suffered two losses at ANGT Kaunas and ANGT Finals last season – to Zalgiris in the Kaunas final and against eventual champs CFBB in group play in Istanbul. The 2000-born Aleksandr Ershov will be back as the reigning Kaunas MVP. The high octane scorer has split his time this season with the U21 Youth team and the U18 Junior side, the latter with whom he is averaging 12.8 points, 4.6 rebounds, 3.0 assists and 1.1 steals. 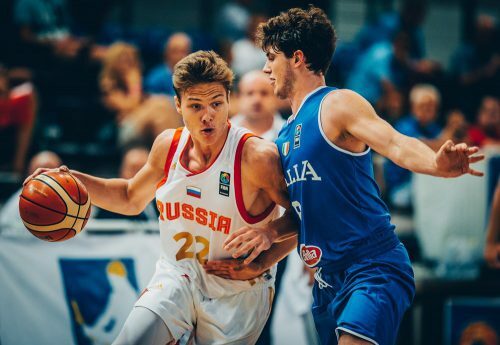 Another major leader will be the 2001-born Viktor Lakhin, who joined the CSKA team at the ANGT Finals in Istanbul and picked up 5.3 points and 3.3 rebounds. He then averaged 9.7 points, 7.7 rebounds, 1.1 assists, 1.0 steals and 1.1 blocks at the FIBA U16 European Championship 2017, not being able to keep Russia from being relegated to Division B despite a big game of 14 points and 13 rebounds against Sweden. Lakhin is averaging 6.4 points, 6.7 rebounds, 1.3 assists and 1.1 blocks in the U18 Junior league, including a 25-point showing against Avtodor and a game of 18 points, 15 rebounds and 5 blocks against Unics on January 10. It will be interesting to see which Vasilii Posrednikov shows up. He scored 21 points and had a 36 PIR in the first two games at ANGT Kaunas but then went scoreless with a -2 PIR in the second two games. He then averaged 2.3 points, 3.7 rebounds and a 3.7 PIR in Istanbul. Denis Kovalev, a 2001-born guard is averaging 10.2 points, 1.8 rebounds and 2.8 assists in the U18 Junior league, including scoring 29 points on 7 three-pointers against Nizhny Novgorod in October. He was also the leading scorer for Russia at the FIBA U16 European Championship 2017 with 11.6 points to go with 2.3 rebounds and 1.4 assists. Makar Konovalov, a 2000-born point guard, is averaging 8.8 points, 1.8 rebounds and 4.9 assists including a game with 23 points against Khimki and 12 assists against Nizhny Novogorod. And top Russian 2001-born prospect Pavel Zakharov will join CSKA for the tournament on loan from Zenit St. Petersburg. He played at the FIBA U16 European Championship 2017 and averaged 8.4 points and 6.6 rebounds. Half of the team is back for a Fenerbahce team that won two games but still finished sixth in Kaunas last season. One of the leaders will be Efe Tirpanci, who is in the process of transitioning from a small forward to point guard – with a 2.07m wingspan on his 2.02m frame. Yigit Kocak will be much more valuable this season after playing well at times last season as point guard. And Adem Bayrak – yes, a member of the Bayrak family tradition – is an athletic long all-arounder. There are also the Donat brothers Ercan and Saadettin, who give the team size. Fenerbahce also feature three players who helped Turkey finish fifth at the FIBA U16 European Championship 2017 and qualify for the FIBA U17 Basketball World Cup 2018. The Fenerbahce team also includes three 2002-born players – the gem of which is Sarper David Mutaf, who is a great scorer as a shooting guard who can finish and also has good court vision. Khimki is playing in its first ANGT since the 2011-12 season so don’t have a lot of track record to call upon. One of the leaders will be Dmitry Kadoshnikov, one of 10 2001-born players on Khimki’s 13-player preliminary roster. The big man averaged 9.9 points and 8.6 rebounds at the FIBA U16 European Championship 2017, including a big game of 13 points and 20 rebounds against Sweden. Khimki also had two other Russian U16 players from last summer in Kirill Studenikin and Ilya Demin. Two of the three 2000-born players were on the Russian national team that won title at the FIBA U16 European Championship 2016, Division B to get Russia back to Division A. Konstantin Shevchuk is a strong floor general, having averaged 10.4 points and 5.1 assists in that tournament. Anton Alakin is the other player from Russia’s U16 team two summers ago. This promises to be one of the most interesting Rytas teams in quite some time and there are many fascinating players to observe. First off, let’s start with Domantas Vilys, a name many people know and one of four players back from a team that won two games in finishing fourth last season in Kaunas. The 2000-born guard will be playing in his third ANGT season and he will be an even bigger leader after last season, where he averaged 14.3 points, 1.8 rebounds, 3.5 assists and 1.0 steals. 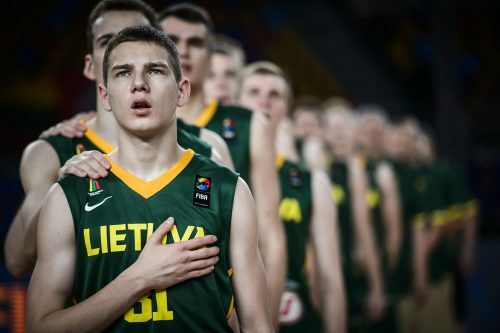 Vilys has been part of a strong Lithuania national team program as well, grabbing second place at the FIBA U16 European Championship 2016 and third place at the FIBA U17 Basketball World Cup 2016. He did not play last summer for Lithuania. Both Mykolas Astrauskas (4.3 points, 1.5 rebounds and 3.3 assists) and Simas Jarumbauskas (6.3 points, 3.3 rebounds and 1.8 assists) played solid roles in last season’s team at the ANGT Kaunas. Deividas Sirvydis meanwhile played just one game last season in Kaunas, collecting 11 points, 5 rebounds, 3 assists, 2 steals and 1 block before missing the rest of the tournament with an injury. The lefty guard played with Vilys on the second placed team at the FIBA U16 European Championship 2016. Sirvydis is a versatile guy who can play at a number of positions and can create for himself. And it will be interesting to see how much responsibility he takes on this team. Sirvydis made his LKL debut last season and this season has already gotten in two games in the EuroCup for Rytas. His father Virginijus Sirvydis had a long career throughout Europe before retiring in 2012 and now coaches in Lithuania’s second division. Sons of players is a common theme for this Rytas team. Augustas Marciulionis is the 2002-born son of Lithuanian legend Sarunas Marciulionis, the 1988 Olympic champion and two-time Olympic bronze medallist. Being still two months shy of his 16th birthday, it’s unclear exactly how much impact Augustas will have. He has played in the EYBL and in five games averaged 10.8 points, 4.6 rebounds and 4.4 assists at the 2002 age group. And the 2000-born Tomas Pacesas is the son of former Lithuanian international Tomas Pacesas, who played at the 1996 Olympics and FIBA Basketball World Cup 1998 and is the current head coach for Lietuvos Rytas’ senior team. But there are still more interesting players on this Rytas team. The 2001-born Marek Blazevic averaged 16 points, 10.6 rebounds, 2.1 assists and 1.6 blocks at the FIBA U16 European Championship 2017. 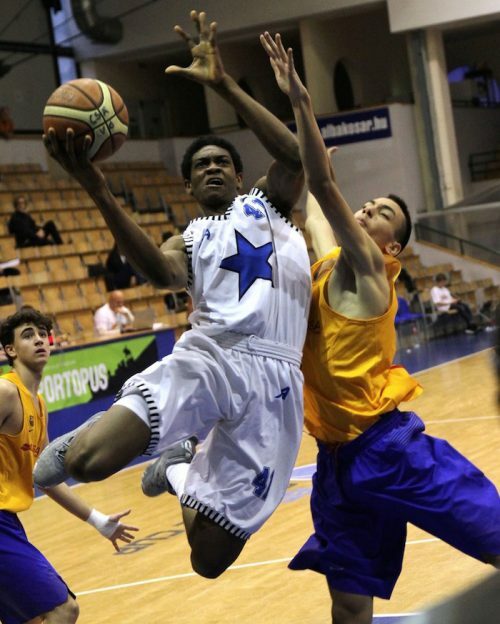 Azuolas Tubelis was also at last summer’s FIBA U16 European Championship and picked up 4.9 points and 4.3 rebounds – albeit as a 2002-born player. And one more player to watch would be Jonas Paukste, who will tower over the rest of the competition at a listed 2.19m. 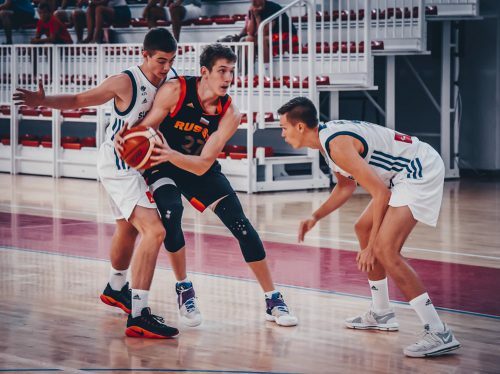 Stellazzurra does not have a lot of Italian talent in the 2000 generation – though Luca Conti did play at the FIBA U16 European Championship 2016 and averaged 8.6 points, 4.4 rebounds and 1.7 assists. This Stellazzurra team instead is dominated by non-Italians and bottom-level players from Italia. Let’s start with the foreign players, which includes a trio from Cameroon, including the absolute gem of this team – Paul Eboua. The 2.03 wing is a legitimate NBA talent with NBA athleticism and a quickly developing game. Eboua only arrived in Italy from Cameroon in 2015 and has only been playing the game for three years. He has great length and is improving his shooting. Stellazzurra are working on transitioning him from a small forward to shooting guard. Eboua had an ANGT Belgrade to forget last season, averaging just 5.3 points, 3.3 rebounds and 1.0 steals – even having to sit out a game. So expect him to want to play really well – though he has been out injured for three months recently and just is coming back to his top level. There are two other Cameroon players on the team in Aristide Mouaha, a 1.90m guard; and the 2.10m big man Russel Tchewa. Stellazzurra also feature two other African bigs in 2.11m Congolese Yannick Nzosa, who was born in 2003; and Dut Mabor, a 2.13m center from South Sudan born in 2001. 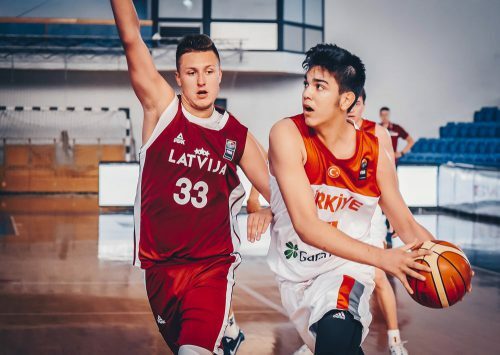 One of the guys responsible for getting the ball to all those bigs will be Dalph Adem Panopio, a 2000-born guard whose parents are both from the Philippines but he was born in Rome. Panopio is a small (1.85m), quick guard who also can shoot from the outside. Moving to the better Italians on the team, first there is 2001-born Lorenzo Donadio, who played at the FIBA U16 European Championship 2017 and averaged 7.3 points, 6.7 rebounds and 1.1 steals. There are two still younger Italians to watch for the future in 2002-born Abramo Pene and 2003-born Matteo Spagnolo. VEF was a very young team last season in Kaunas with just two 1999-born players. And this group will have seven players back from last year’s squad. That being said, there are three big parts from last season that are not on this team – Edvards Mezulis, Valters Veveris and Adrians Snipke. So, let’s move to whom is with VEF in Kaunas. The leader of the team will most likely be Oskars Hlebovickis, who was born in Warsaw, Poland, and can play at both wing positions and can also play back to the basket. He has a high basketball IQ and it will be interesting to see if he can step up his aggressiveness offensively to match his potential. Rodrigo Bumeisters was a big part of the team last season and will likely take on a bigger role – though he must improve his three-point shooting. Rainers Hermanovskis has shown this season that he can be a real threat from the outside. The other four players back will be Aleksis Emsins, Niks Linis, Gints Zomerfelds and Matiss Surkulis. 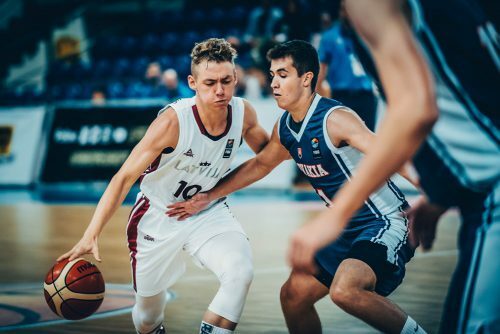 The 13-player preliminary roster also includes three 2001-born players, including Emils Krumins, who averaged 8.0 points, 3.1 rebounds and 1.6 assists at the FIBA U16 European Championship 2017. There is also the 2002-born Toms Liepins on the squad. Zalgiris came through with the title last season in Kaunas, but only after a struggle in the final against CFBB – nearly wasting a 13 point fourth quarter lead. That extended Zalgiris’ winning streak to five straight ANGT Kaunas titles from 2011-12 and 2013-14 to last season (the 2012-13 ANGT campaign was played in Siualiai and not in Kaunas). There are seven players back from the team last season, including Rokas Jokubaitis, who hit the game-deciding three-pointer in the final and really deserved a spot on the All-Tournament Team, especially after picking up 17 points in the final group stage game against CKSA Moscow to get Zalgiris in the final, where he paced the hosts with 18 points and 6 assists. Jokubaitis is a joy to watch as he has complete control of the game when he has the ball. 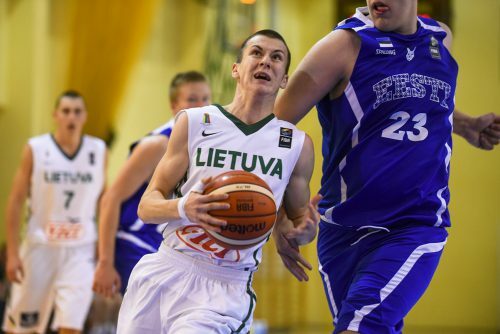 The 1.91m point guard’s father Aivaras was a low post player for a number of years and made the Lithuanian top flight. Rokas’ mother also played basketball and his sister still does. Jokubaits also has had international success, helping Lithuania to silver at the FIBA U16 European Championship 2016 and then last summer averaged 10.0 points, 3.1 rebounds and 5.3 assists at the FIBA U19 Basketball World Cup 2017. Martynas Arlauskas was another major part to Zalgiris’ success last season with 8.0 points, 1.6 rebounds, 2.9 assists and 1.1 steals while hitting 37 percent of his three-pointers at the ANGT Kaunas and ANGT Finals in Istanbul. Arlauskas, a 1.99m guard who also was on the 2016 U16 national team that took European silver, has already played four EuroLeague games this season with Zalgiris’ senior team. Erikas Venskus was another member of the U16 European silver medal winners and also picked up bronze at the FIBA U18 European Championship 2017. The 2.05m big man averaged 9.6 points and 5.4 rebounds last season at the ANGTs and is a perfect role player in the blocks, who can score in double digits with ease due to his excellent efficiency around the basket. He’s also a solid rebounder and is learning to become a better shotblocker. Volodymyr Markovetskyy will be playing his third season in the ANGT and this could be the time when the 2.16m Ukrainian big man steps up after having only a minimal role in past tournaments. Giedrius Bergaudas is a 2.09m low post player who could be in the same boat though there is some nice fluidity in Bergaudas’ game if he can work it out of himself. Also back are Nedas Kancleris and 2001-born Modestas Kancleris – no relation. Modestas played last summer in the FIBA U16 European Championship 2017 and averaged 9.1 points and 6.9 rebounds and showed some promise. He is one of four 2001-born players on Zalgiris’ 14-man preliminary roster along with Laurynas Vaistaras, Gabrielus Celka and Nojus Pankratjevas. The most interesting of that group is Vaistaras, who was the captain of Lithuania’s team at the FIBA U16 European Championship 2017, where he averaged 8.3 points and 6.7 rebounds. He was coming back from a major injury and showed what he can do with 21 points against Israel and 8 points and 10 rebounds against Finland and 9 and 9 against Montenegro. Vaistaras was also the flag bearer for Lithuania at the 2017 European Youth Olympics Festival Flag bearer.